Even a successful total knee replacement surgery involves a long and painful post-operative recovery period. However, according to a recent feature from Med Page Today, this might not always be the case. This article discusses a new medical protocol designed to do away with motor nerve blocks and reduce the use of opioid (narcotic) painkillers following surgery. With traditional protocols, doctors gave patients a broad-spectrum analgesic agent before surgery. This included a nerve block consisting of ropivacaine, as well as narcotic pain control drugs such as OyxContin, in patients who are younger than 80 years of age. In older patients, pregabalin was used along with aspirin, due to complications opioids can cause to elderly patients. During surgery, doctors administer additional medications, including tranexamic acid, multiple times. Doctors will then administer a morphine-based pain killer through an IV. A femoral nerve catheter is used as nerve block and continued the day following surgery, along with a whole host of other medications. Not only did doctors want to do away with the need for a virtual pharmacy’s worth of medication to be administered to a patient during total knee preplacement surgery, all these drugs mean patients stay in the hospital longer. Under the new rapid recovery protocol, a single shot is given to a patient prior to surgery, and a much smaller dose of drugs is given through a block. During surgery, a drug called bupivacaine liposome is administered to patients, along with epinephrine and Tylenol. This new rapid recovery procedure allows patients to be given less potentially dangerous drugs and leave the hospital days earlier than with traditional surgical methods. As our Boston knee replacement injury attorneys can explain, there will always be some level of pain associated with what is truly a major surgery, despite what medical device companies want us to believe. While most doctors perform excellent work and implant well-designed medical devices, there are unfortunately many exceptions to this fact. As we have seen from various artificial knee makers, corners have been cut, and safety studies have been skipped, as potentially dangerous devices are pushed through FDA approval and implanted in patients, where they have failed and caused significant pain and suffering. 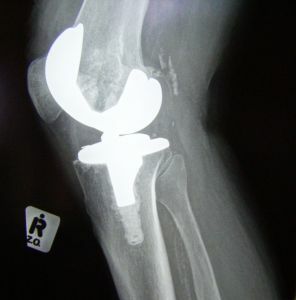 One of the reasons artificial knee manufacturers have been able to fast-track approval and skirt safety studies is a loophole in federal regulations allowing a device which is “substantially similar” to another medical device already on the market to skip many of the steps the first manufacturer had to go through before FDA approval. This is a result of significant lobbying efforts by medical device manufacturers to convince legislators that medical devices are not as complicated as pharmaceuticals and do need the same level of review and oversight for substantially similar products. Some of these new artificial knee and artificial hips were, in reality, vastly different from ones already on the market, but still fell within this exception. For example, if a ceramic on ceramic joint is already on the market and another company wants to try metal on metal, they may be able to get around much of the safety testing. In the case of metal on metal hip joints made by DePuy, artificial joints were found defective and caused a great deal of pain and suffering.